A Brilliant Hi Happy Wins The Gran Premio Nacional In Argentina: The Gran Premio Nacional (GI), the Triple Crown’s third leg, is the most important race for three-year-olds in Argentina, so much so that the winner is usually named the best three-year-old of the year. This year, the race took place on November 8, 2015, at Hipodromo Argentino de Palermo over 12-1/2 furlongs on the dirt. Hi Happy won the Gran Premio Nacional (GI), the third leg of the Triple Crown and the most important race for three-year-olds in Argentina on Saturday, Nov. 7, 2015. 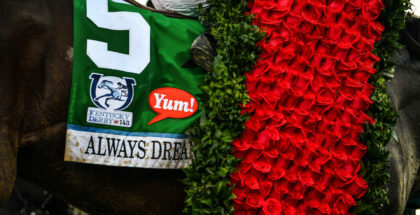 There were many expectations for the race due to the presence of horses with great quality, like Le Blues, a son of Roman Ruler who won the first leg, the unbeaten Hi Happy (Pure Prize), winner of the second leg, the speedy Old Bunch (Not for Sale), and the filly Doña Joya (Jump Start), among others. As expected, Old Bunch, with the speed that is now so expected of him, was sent to the lead in an attempt to win gate-to-wire. Meanwhile, Doña Joya immediately sat in second place while Le Blues and Hi Happy patiently stalked the pace. At some point, Doña Joya made a move trying to pass Old Bunch, but the gutsy pacesetter held off the filly and pulled away by two lengths. Old Bunch entered the stretch alone and looked like the winner of the race since Doña Joya failed in her attempt to catch him, but the unbeaten Hi Happy flew late to catch him in the last strides. A consistent Don Inc (Include) finished third, and Doña Joya was fourth. 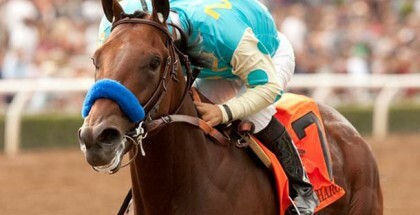 Le Blues, the winner of the Triple Crown’s first leg, was no threat this time as it seems he didn’t like the distance. 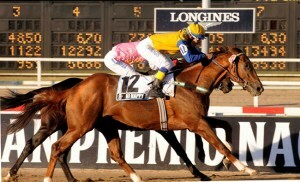 With this win, Hi Happy remains unbeaten in Argentina and dispelled doubts about his skills over dirt. It is also laudable that Old Bunch’s run exhibited a real show of courage. The filly Doña Joya challenged the males and didn’t disappoint since she never really stopped in the stretch – the others were just faster. Hi Happy is a three-year-old son of Pure Prize (USA) out of Historia (ARG), by French Deputy (USA). He was ridden by Altair Domingos and is trained by Pedro Nickel Filho. The winner clocked the 2500 meters (12-1/2 furlongs) in 2:34.69 and is now unbeaten in five starts. Certainly Hi Happy deserves the three-year-old championship title, and a bright future is expected for him. The next goal for Hi Happy will be the Gran Premio Carlos Pellegrini (GI), the most important race in South America. Old Bunch will likely point to the Gran Premio Jose Pedro Ramirez (GI) on January 6 at Maronas in Uruguay.